Meri-Jo Borzilleri Fans can get an opportunity to check out the America's Cup. BELLINGHAM, Wash. -- It's a trophy that's tall, silver and heavy with history. The winning team gets to keep it until there's a new champion. It gets its own seat in the plane -- business- or first-class only -- and travels in a padded case with its own white-gloved security detail. It's not the Stanley Cup, but sailing's America's Cup, said to be the oldest continuous trophy in sports, first awarded in 1851. It's back in the United States for the first time in 15 years, and it's on tour. Most people hadn't noticed the Cup, nicknamed the "Auld Mug," was gone. America last won the America's Cup in 1992 and hasn't been home to the Cup since 1995, the next time the event was contested, when it was lost to New Zealand. Following lengthy and complex legal wrangling over race format between defending champion Alinghi of Switzerland and U.S. billionaire Larry Ellison's BMW Oracle Racing syndicate, the series returned to the water in February. Ellison, the Oracle software magnate and world's sixth-richest man, used a revolutionary trimaran to cruise to a 2-0 win in a best-of-three series off the coast of Spain. Now the America's Cup will likely be contested on its namesake's shores, probably within the next three years, and Ellison is determined the country will know it this time. His challenge: get Americans interested in a sport many see as boring, confusing and high-brow. So a trophy tour that includes plenty of public face time, instead of showings limited to exclusive yacht clubs, could help. Meri-Jo Borzilleri Unlike the Stanley Cup, people can't touch this trophy. "Sailors understand it," said Tom Ehman, BMW Oracle Racing Team director of external affairs. "This is their Stanley Cup. This is their Holy Grail." First-time viewers of the trophy, an ornate Victorian ewer stacked atop three bases, often walk away dazzled. In Anacortes, Wash., where the winning boat was built, the America's Cup was treated like a rock star during an April appearance. Sparkling from a recent polish and dozens of flashbulbs, the trophy was held aloft by two security guards pushing through a whooping mosh-pit of 1,000 people. Later, red velvet ropes separated it from the public. Chelsea Ramerman, 32, was there with her husband Matt. "It blows my mind," Chelsea said. "I don't know a lot about sailing. I didn't know any of the history. It's gorgeous." Giddy sailors have doused it with champagne, clutched it overhead with sweaty paws, given it sloppy-wet smooches. But during public tours, with its nearly 160 years' worth of engravings of past champions, it appears to be treated like a museum piece. 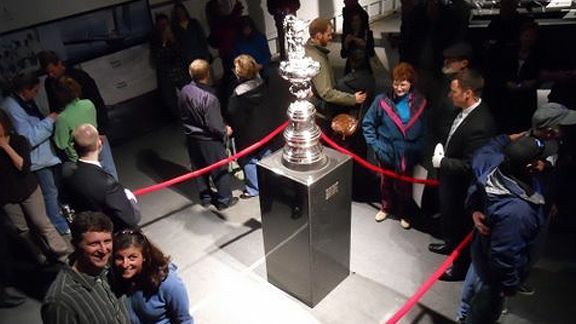 And unlike the Stanley Cup, trophy handlers insist the America's Cup won't be seen propped in a poolside deck chair, lugged to a wedding, hiked to the top of a mountain, or sleeping with Sidney Crosby. Frequent contact with bare hands is a no-no, because skin oil degrades the silver and could melt off the engraving. And with all of the engraving, two bases have been added, more than doubling the trophy's original 27-inch height. Security guards, wearing hidden earphones and Secret Service faces, accompany the Cup everywhere it goes. When the Cup resided in San Diego after Dennis Conner won it back from Australia in 1987, it was housed in a glass case with its own alarm system. In its current home, San Francisco's Golden Gate Yacht Club, the trophy is locked away off site each night. The trophy travels in a 5-foot-tall Louis Vuitton case, too big for airport screening machines, and the case must be searched by hand. But sometimes security isn't enough. In 1997, while on display in New Zealand's harbor, a political activist carrying a bag containing a sledgehammer pushed past guards and smashed it with several blows. 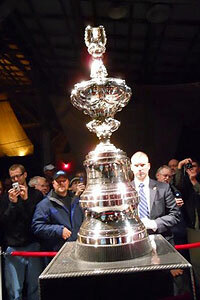 The trophy was sent to a special silversmith for major repairs. New Zealanders were aghast such a thing could happen in a nation where racing is revered. A replica of the 35-pound sterling silver trophy would cost about $50,000. But the Cup's history makes it priceless, Ehman figures. "It's uninsurable," he said. "It's like the Mona Lisa." Meri-Jo Borzilerri is a freelance writer for the Sports Media Exchange, a national freelance network. Meri-Jo Borzilleri has been a journalist for more than 20 years, most recently for the Colorado Springs Gazette, where she covered the U.S. Olympic Committee and three Olympics before resigning to freelance in 2007. Her work has appeared in The Seattle Times, USA Today, ESPN.com, nbcolympics.com, universalsports.com and The Associated Press.